This 2-year-old boarded his flight in style as the friendliest passenger on his airplane, fist-bumping people as he walked down the aisle. Watch video. (KANSAS CITY. Mo.) 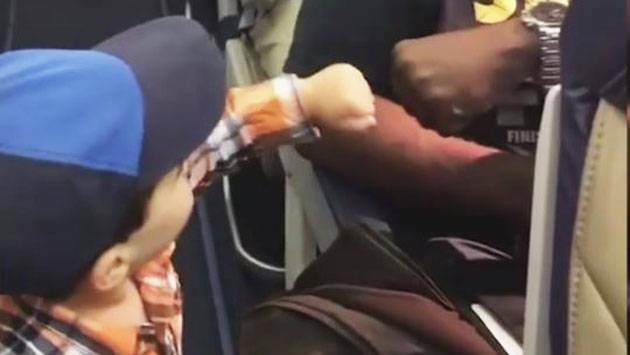 — This 2-year-old boarded his flight in style as the friendliest passenger on his airplane, fist-bumping people as he walked down the aisle. The family was flying from Kansas City, Missouri, to Chicago, Illinois, on their way home to Raleigh, North Carolina, on July 20 when the precious moment was caught on camera. Ever since then, everyone Guy encounters gets the friendly greeting. “We just got back from the library and he fist-bumped everyone there. We just dropped off his sister at school and he fist-bumped everyone in the administration office,” his mom said. Southwest Airlines shared the video on their Facebook page where it has gone viral with nearly 70,000 likes. Jakubowicz is thrilled her son is helping spread joy across social media.